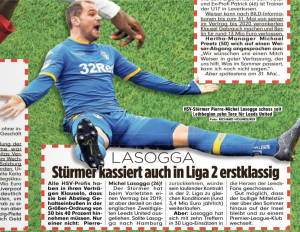 We thought the German media had forgotten about Pierre-Michel Lasogga. From a time when they used to comment on absolutely everything the Leeds United player did, good or bad, nothing has really been getting a mention for the past few weeks. It’s probably got a lot to do with Hamburg’s futile looking battle against relegation. Things have become very serious indeed at HSV, so their local media have largely ignored Lasogga out on loan at Leeds. Bild do feature the striker in their Friday newspaper and explain that if he were to return to Hamburg then he’d continue earning €3.6m a year (just over £3m) for the final year of his contract. Unlike the majority of Hamburg owned players, Lasogga doesn’t have a clause which sees his wages drop 30-40% with relegation. That makes an exit all the more necessary and probably ups the chances of a free transfer or a move for a relatively low fee. Bild believe Leeds United fans are ‘in love’ with Lasogga, with the hint he could therefore remain and sign a permanent deal. That has looked like a distinct possibility at some times during the loan, now isn’t one of them. 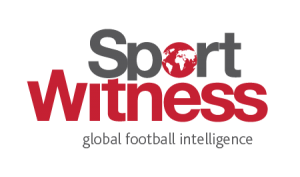 Once again, interest from the Premier League is claimed.